IQD’s new STXO series of surface mount clock oscillators has been designed with an ultra-low integrated RMS phase jitter of 256fs at 2.5V and RMS period jitter of 1.4ps over 10,000 cycles. With a phase noise level of -138dBc/Hz @ 1kHz and -163dBc/Hz at the noise floor, this new series is ideal for defense & aerospace applications such as smart munitions, guidance & navigation and communication systems; although the devices can also be used in demanding industrial applications. Designed around a hermetically sealed high-shock crystal and a CMOS compatible integrated circuit, environmental performance is also good with the STXO able to survive shock levels of up to 20,000G and vibration levels of 20G at 10-2000Hz swept sine in accordance with MIL-STD-202G. 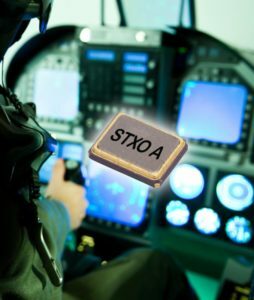 Housed in an industry standard 3.2 x 2.5mm 4-pad ceramic package with a metal lid, the new STXO series uses minor temperature compensation to achieve tight frequency stability of ±10ppm over an operating temperature range of -40 to +85 degrees C and ±20ppm over the full military operating temperature range of -55 to +125 degrees C.
Frequencies between 10MHz and 55MHz can be specified along with a choice of 2.5V and 3.3V supply voltages; current consumption is 3mA with a 15pF CMOS drive capability. Variants are also available which incorporate enable/disable and tri-state control. In keeping with its military capability the range can be specified with a number of termination finishes including tin/lead in applications where using a device that is RoHS compliant would cause approval issues. However RoHS compliant finishes are also available for less sensitive applications. Duty cycle is 45% min and 55% max with a start-up time of 5ms max and a rise and fall time of 5ns max. Packaging options include tray pack or tape and reel. This entry was posted in Europe, Frequency Control Products, Frequency Control Products, Frequency Control Products, Global, North America, On Ticker, top articles, UK. Bookmark the permalink.